Notes from the garden and the land, “Green Allies” is about the garden we grow and the wild plants we harvest from our surrounding mountains and deserts. It has recipes for homemade body care, stories of wildcrafting, and using herbs and homeopathy to heal our family. Well it’s a banner year for grindelia, which gringos call gumweed, here in the high desert. Times like this, the bioregional herbalist in me comes on strong and I think, hey, that’s good medicine. Let’s use that little weed like the gift it is. I basically went to the school of bioregional herbalism, the place where we were taught again and again that the medicine nearby is the right stuff to use, that the mallow in the garden is not meant to be pulled and left for mulch but dried with care and used through the year for the myriad ailments the kind creator gave us the wisdom to use it for. So I’ve got baskets of it on the counter, and horsetail and nettles and mint and mullein and all the other things that are so abundant and good. And there’s a few things I find myself yearning for, too, things I know are as common where you live as gumweed is here. Like red clover blossoms, or black elder berries (dried or tinctured or elixired), or even things you might have an excess of in the garden, like lemon balm or comfrey or calendula blossoms or tarragon. So I thought maybe we could do a little swapping. Maybe you could harvest what is abundant around you, and trade it with me and others who have a different sort of bounty in their life. 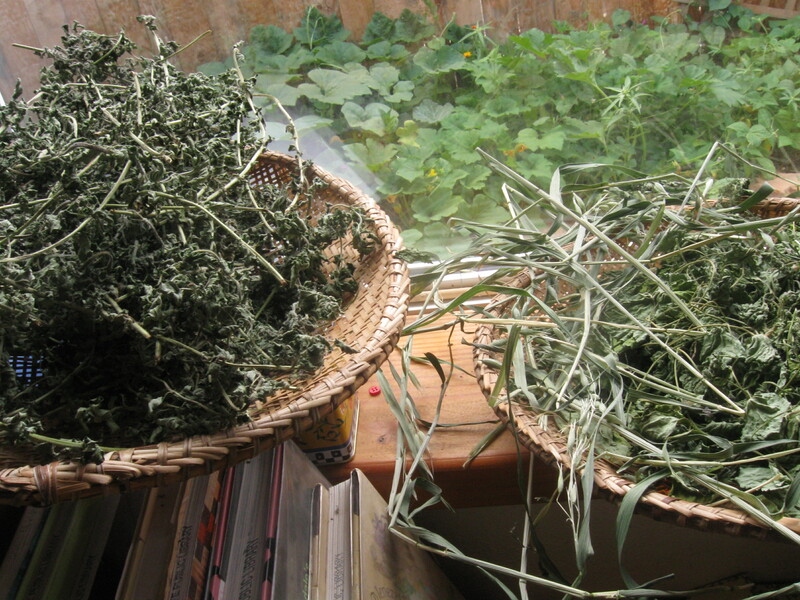 If you have a knowledge of the weeds and herbs abundant where you are and want to join in this exchange, please do. My only request is that those participating do so with care and respect for wild plants, and use ethical wildcrafting practices. Whether you are my neighbor down the road, or far off in an unthinkably moist land, we all have something to give. 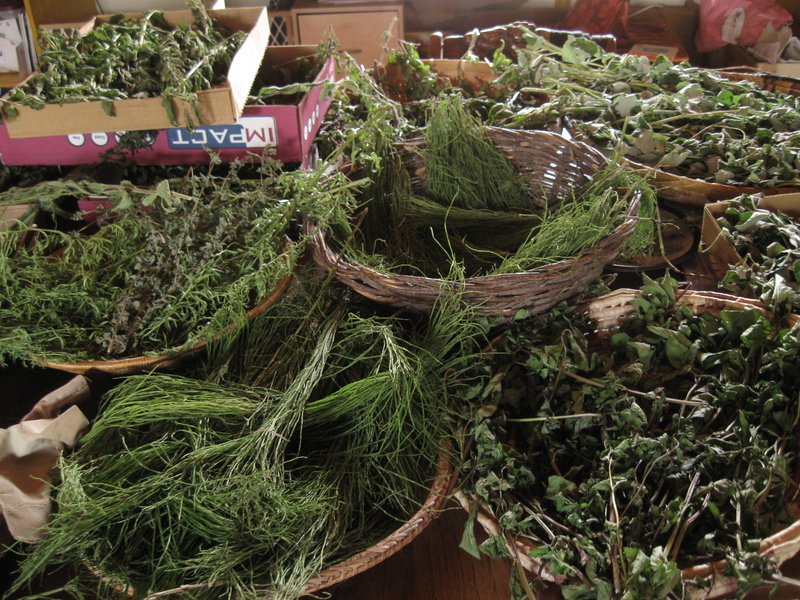 If you’d like to offer herbs, or ask for an herb or two that you need, please do so in the comments. I’ll serve as matchmaker and figure out the logistics later in the season, when we’re done with our joyful gathering. Happy Earth Day weekend, month, year, life! The randomly selected winner of How-to is Becca T. Thank you to all of you for your kind words and support of poetry! I am grateful to be a part of this project that honors the work of nurturing–be it a garden, a community, a life–in such a lyrical way. If you really had your heart set on it, do consider purchasing a copy from the publisher, Old School Books. For the rest of you curious readers, here is one of my poems that appears in the book. It’s about how I have to teach myself how to make zucchini fritters each year as if for the first time. And other things. Like an afternoon in a community garden. Enjoy and be well! of fertile earth. This sound of unnamable delight. 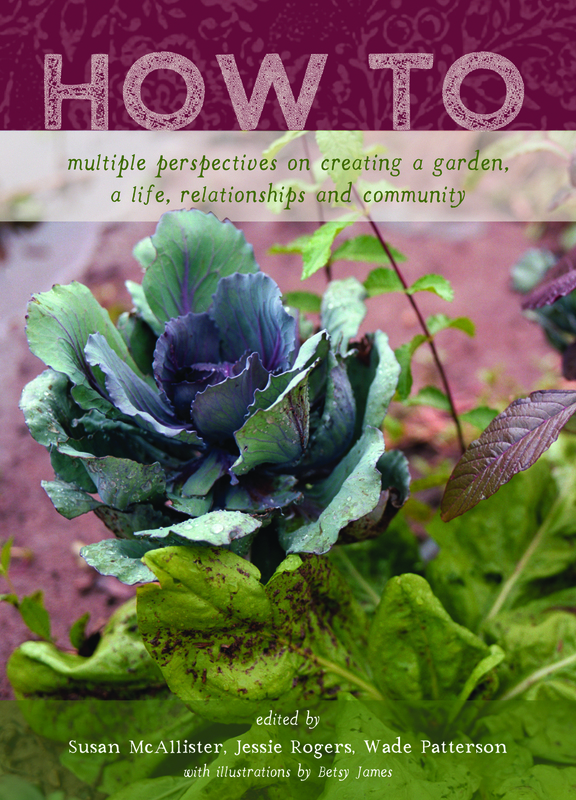 I am honored to have a handful of poems included in How to: multiple perspectives on creating a garden, a life, relationships, and community, the latest poetry anthology from Albuquerque’s Harwood Art Center. 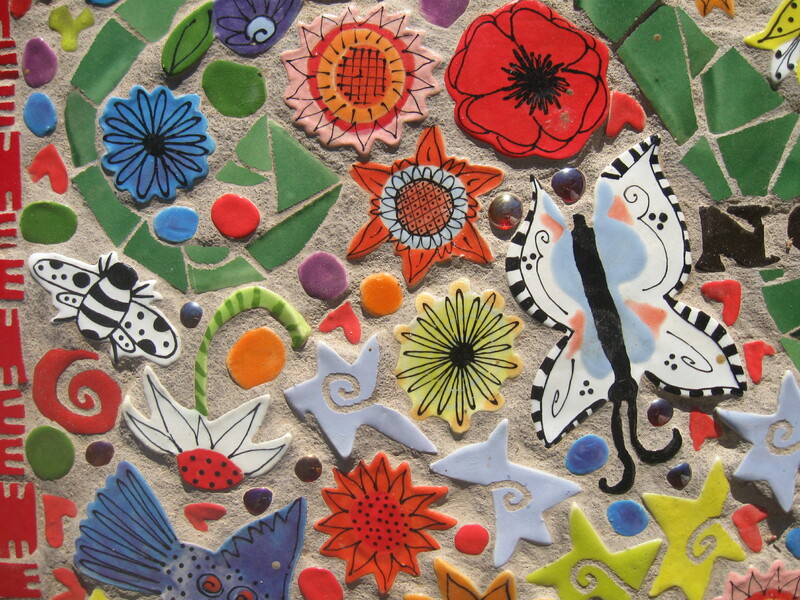 It is a celebration of land, relationships, community, and heritage, all told through the metaphor of gardening. It also happens to be so good that I want all of you to read it. But I only have one extra copy. So, in honor of Poetry Month, and the land you live on, whether or not you call it a garden, and in honor of you, my dear readers, whether or not you call yourself a poet or gardener, it is my pleasure to give away a copy of this genius little book. To win, please leave a comment (just say hi if you like) by clicking on that little talk bubble at the top of this post. Giveaway ends Sunday, April 22. Ordering the Stars is being interrupted to bring you a special message from this week’s sponsor, The Santa Fe River. Please continue chilling out, until the next installment. 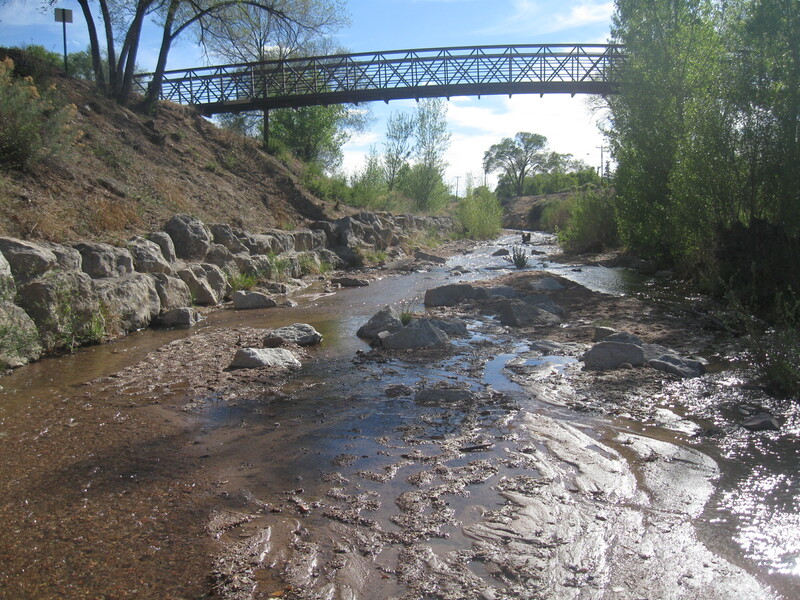 After a long dry spell, friends, the Santa Fe River is flowing once again. Or trickling. Yes, we call that a river around here. 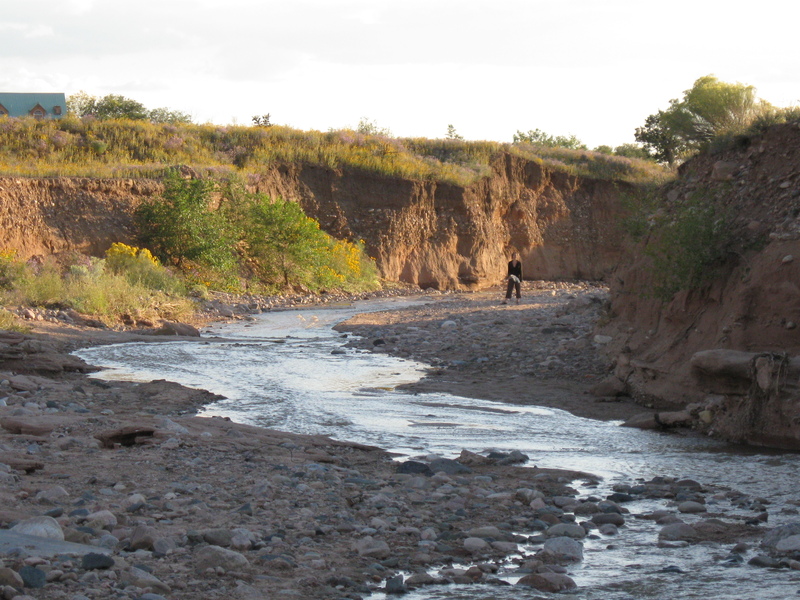 Without this river, there would be no Old Recipe (or Santa Fe, for that matter!). It sustains us body, mind, soul, and most especially heart. Thank you river, for making this life possible. What’s your land offering, these days? In the midst of harvest season, I remember to gather the last of the medicines we’ll need this winter. 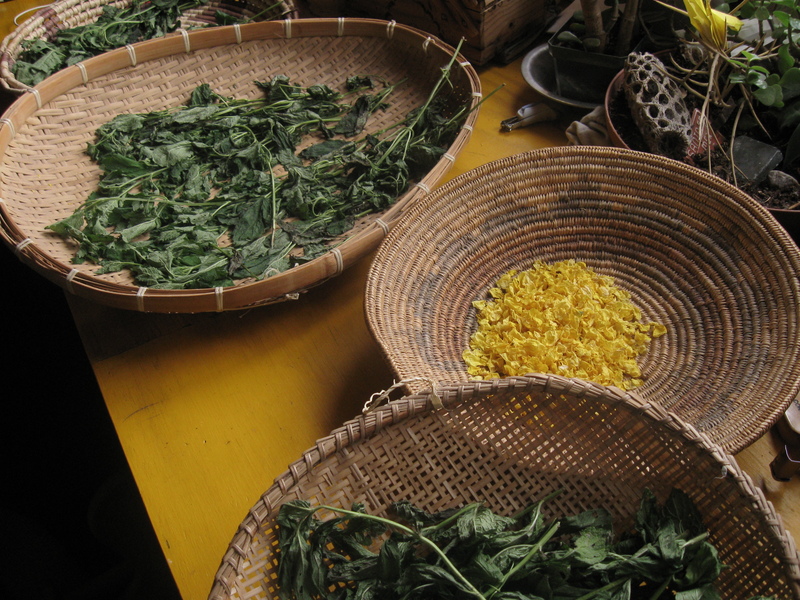 Many of the herbs we gather, mostly tea plants, come from the mountains. It is one of the most important things we do each year, a pilgrimage of sorts. And there is also much medicine to gather here in the garden. 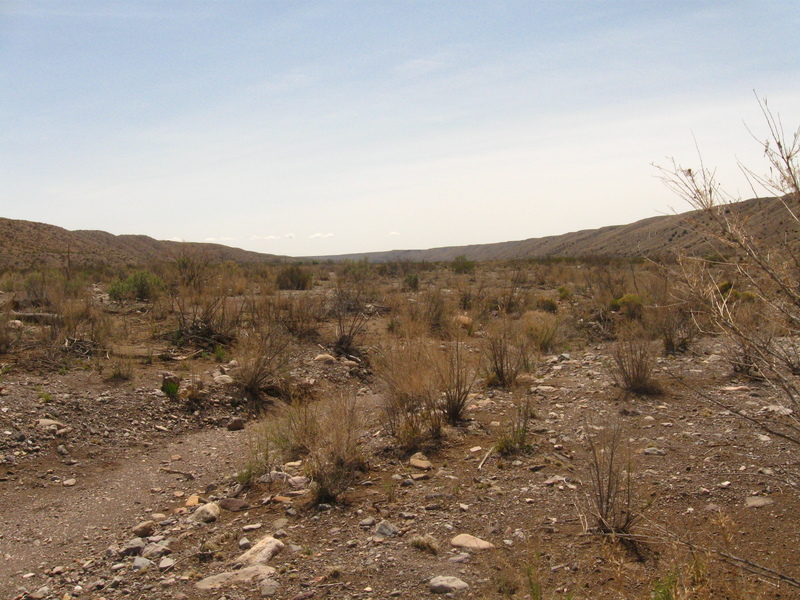 Some were planted intentionally for that reason, like the mint, oatstraw, and nettle patch (yes, that’s the kind of thing we actually cultivate in New Mexico). Some things were planted for beauty, like the roses and lavender and Echinacea. Some things are volunteers, so humble and common I have to remind myself of the power in their small, dark green leaves. That’s the mallows, and the alfalfa. Potent plants that will nourish us all through the winter. Wild, cultivated, and vagabonds from between the cracks: We gather them all. 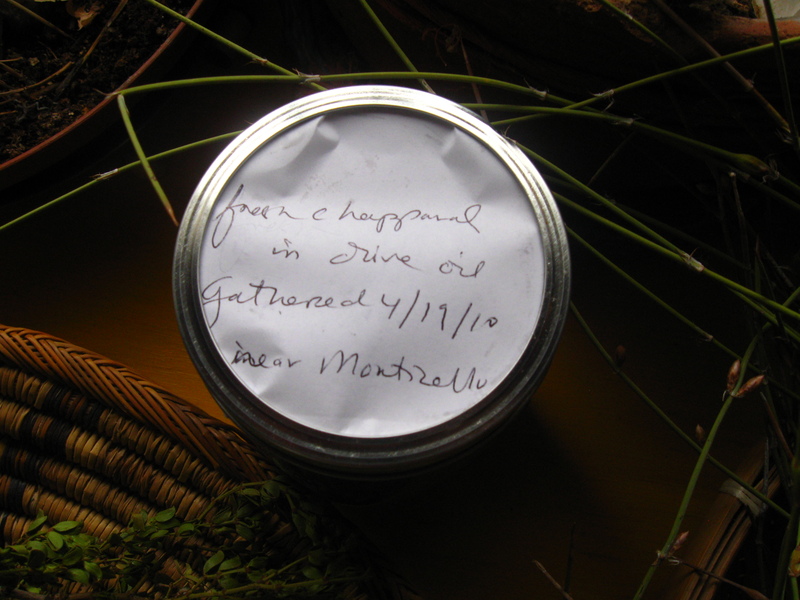 Having a relationship with our medicine, even if it’s just some alfalfa tea from the front yard, is a powerful way of re-localizing our habits and connecting with seasonal rhythms of our home. It empowers us as healers, deepens our sense of place, and reduces the harm we cause to the planet in our quest for natural remedies. 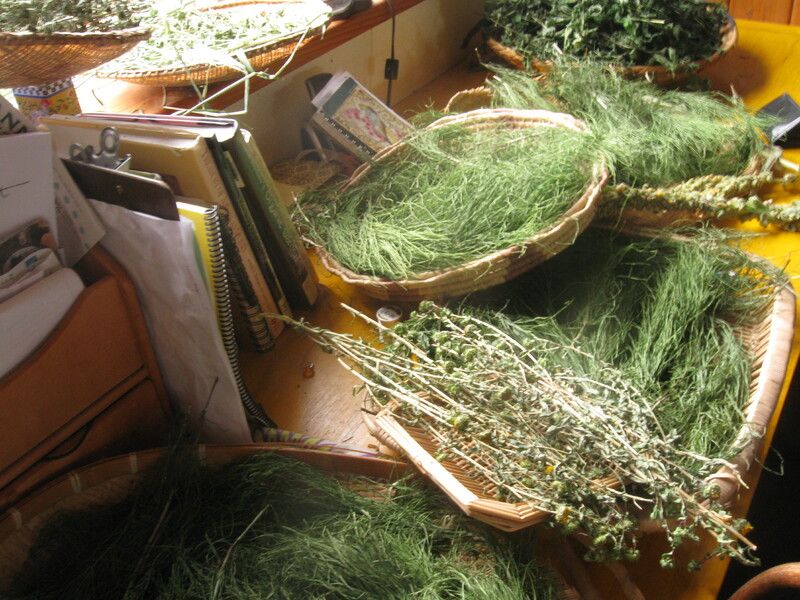 We become healers of the landscape as we tend the stands of herbs that surround us in spaces both wild and domestic. And the herbs, of course, take care of us in return. It is an ancient partnership. One each of us can claim and celebrate in these last days before winter. Disclaimer: I wouldn’t trust this cream at the beach, above tree-line in the mountains, or even on a hatless hike at midday. But as my summer cream, put on under a hat to spend a morning puttering in the garden or for a walk in the late afternoon, I think it’s splendid. Apparently, the oils used in this cream have a bit of an SPF value–some say as much as 15. I don’t think they offer any UVA/UVB protection, and how that reconciles with the claim to an SPF I cannot say. I’m not a huge user/abuser of sunscreen, though I do use it when it seems necessary. This cream is for the rest of the time. When I’d probably not have anything on at all. I also wear a hat. And believe in light tans. 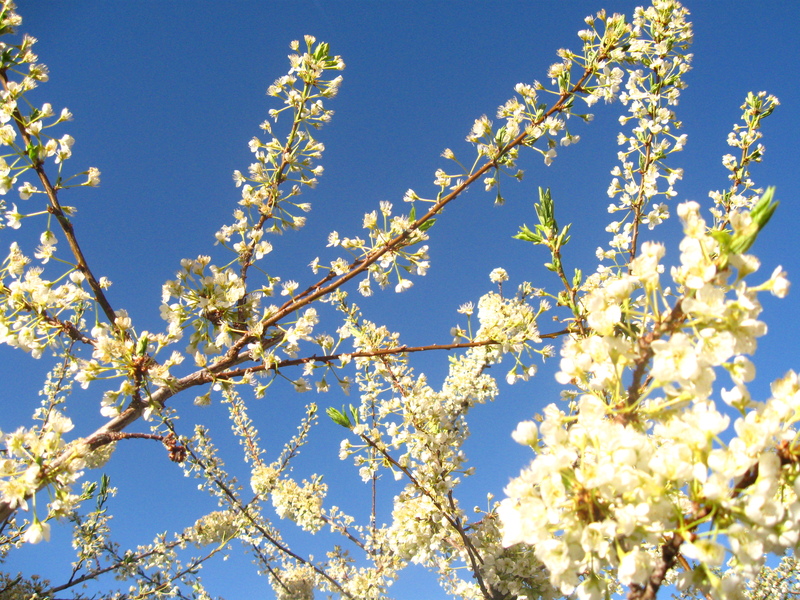 I confess to having an inordinate amount of faith in the power of chaparral oil to protect the skin from sun damage on nothing more than ethnobotanical evidence. Beyond that, common sense in the sun must prevail. I made this recipe with a friend, and it yielded a lavish summer supply for both of us. 1/3 C unrefined Avocado oil (we used chaparral oil instead). Let this mixture of oils set until room temperature, and partially solidified. Set blender whirring on high-ish. Pour partially solidified oil mixture sloooowly into center of vortex. Blend away. Watch and listen–the cream will do its alchemy of marrying oil and water and that moment is amazing and miraculous everytime. It will thicken and turn creamy colored. Give it another couple seconds, then stop. 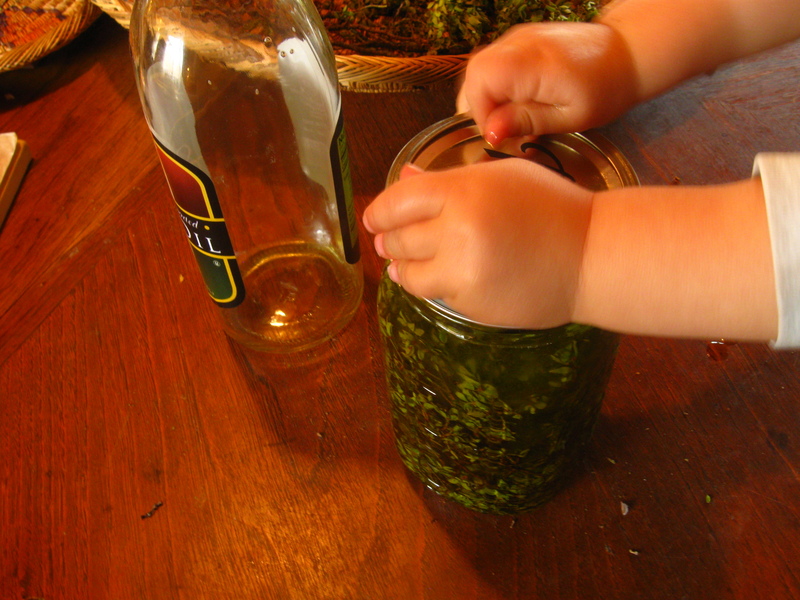 If there is any loose oil or water, blend it in by hand–over beating will not improve things. This cream is nourishing, soothing, and possibly slightly protective. For me, that’s all I was after. When I run out of store bought sunscreen, I might add some zinc oxide to this lotion and call it a day. Be safe in the sun, friends. Here it is folks, the Long Awaited, Much Anticipated Old Recipe Garden Party Extravaganza. Thanks to all who contributed posts, and to all of you who left comments about your passion for soil and sun and the miracles that take place in-between. 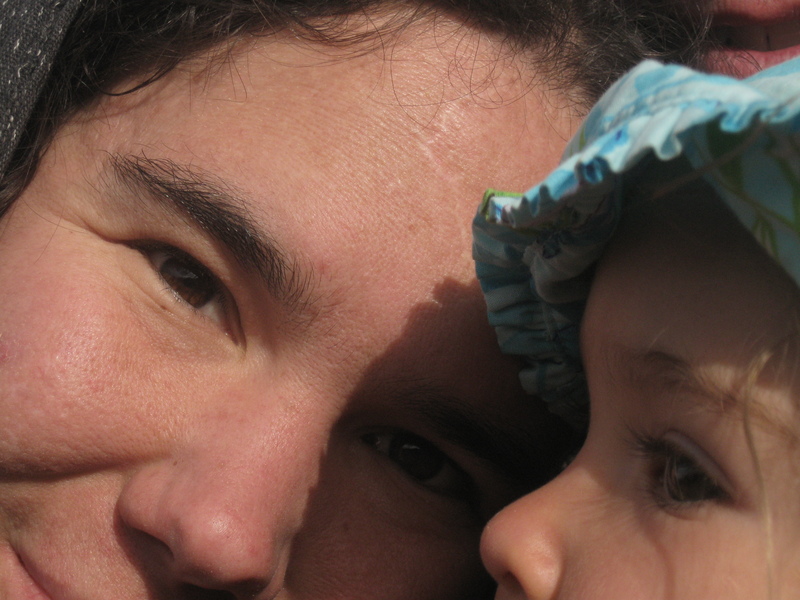 Christina of Tumbleweeds and Handful of Seeds wrote about falling in love with her tumbleweed farm. 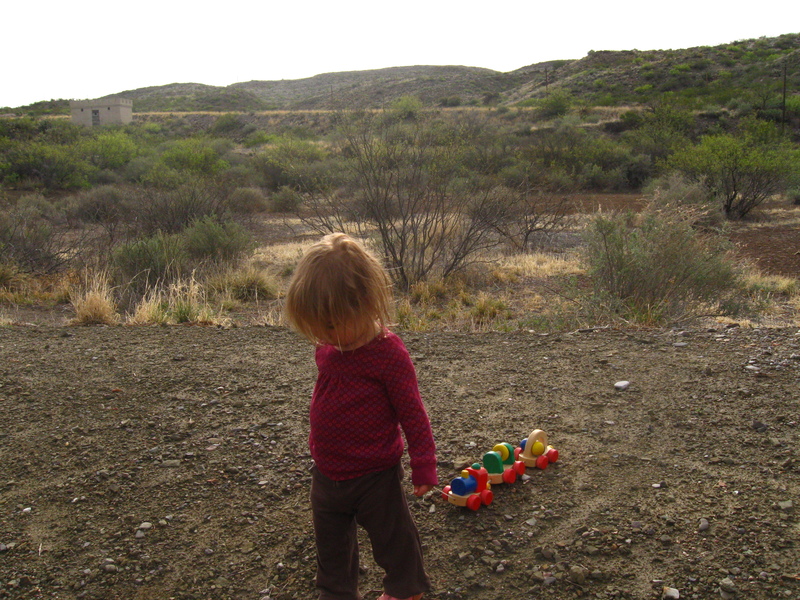 I am excited to follow her journey as a high desert locavore. 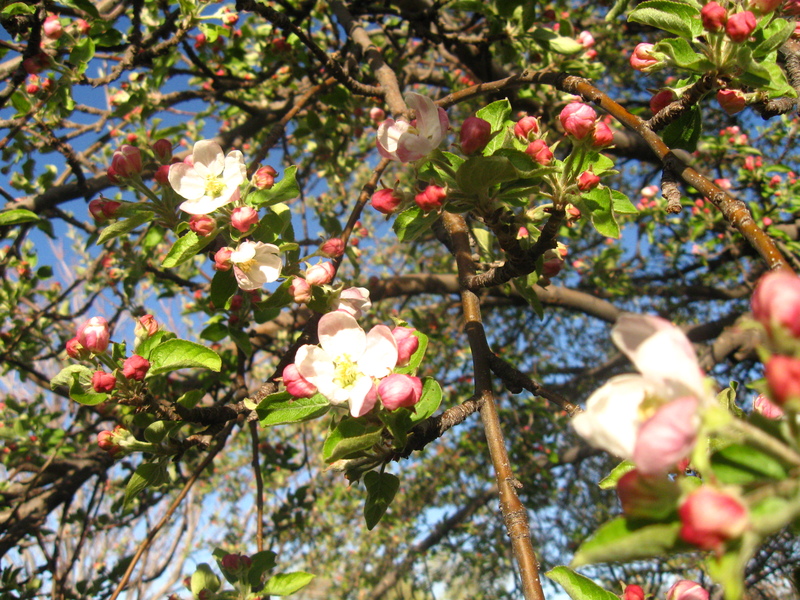 Renee at FIMBY wrote a beautifully illustrated post about…gardening for beauty, of course. Shadymama from Adventures from the Motherland offered a piece of poetry after my own heart. She writes “i find myself paying more attention to the moon and my breath. to my feet on the ground, my soul and my needs. to presence and truth. these are the lessons of my land.” And lot’s more good stuff. 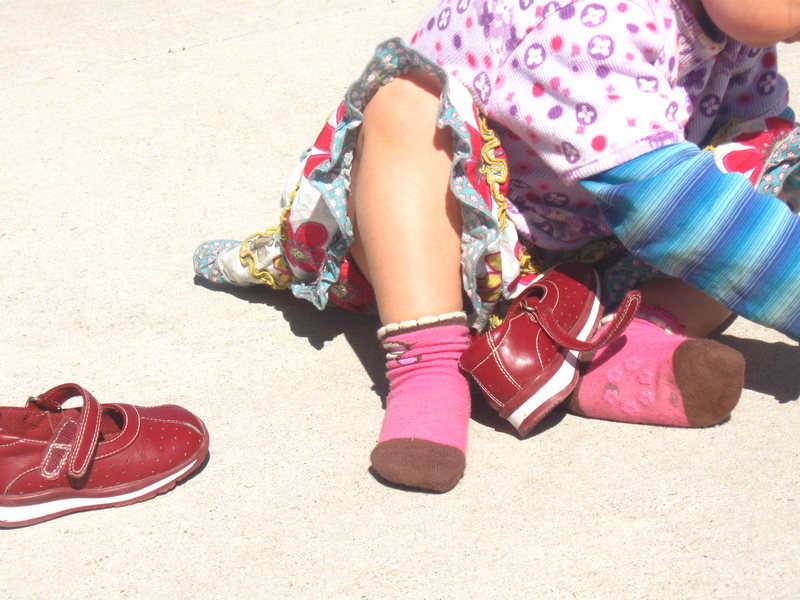 Emily at Laundry and Lullabies wrote about the joy of gardening, and tells her woeful tale of crabgrass. It made me feel better about my bindweed. Rachel at 6512 and Growing pretty much rocks it with this post called I Dig Dandelions and Apricot Blossoms, and this one about a romantic manure interlude. 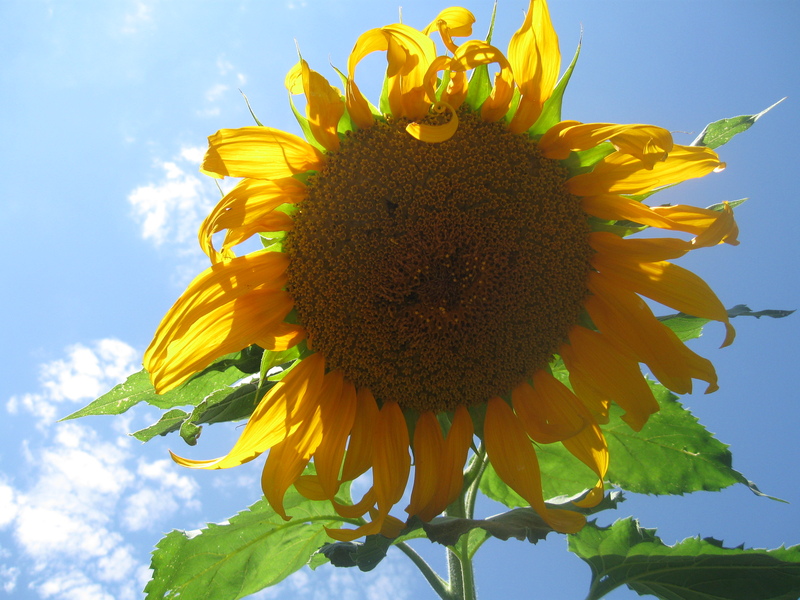 And my personal garden guru, Erin at Seedybeans, took a break from her customary dispensing of invaluable gardening advice to tell us just why she gardens. In the garden, she writes, “I have found myself as a woman, one hand marveling at our mothers mysteries, and the other spinning seeds and stems with my own gifts.” Ah, yes. My own post can be found by just scrolling down a bit. Or if you’ve arrived here in some roundabout way, click here. Lastly, I’d like to make Michael Pollan an honorary homegirl and include his ever relevant and motivating article “Why Bother?” in this lineup. I consider it required reading, and revisit it at least once a year when I need reminding of why I live this way. It’s ultimately about gardens, but everything else, too. My garden is a small part of what I consider home. 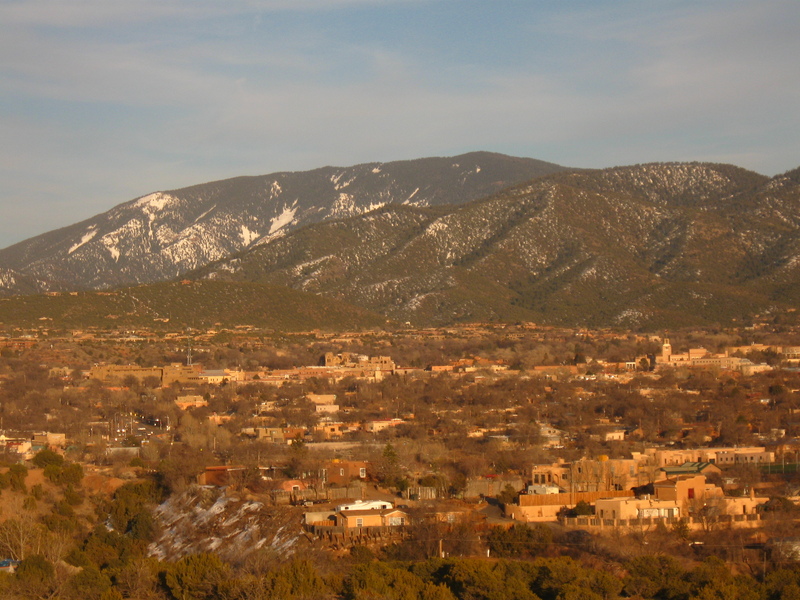 Home is the high mountains rising up in all directions and framing the huge valley with various watersheds winding towards the Rio Grande. This open space, with the vistas I know with my eyes closed and the trails I have followed in all seasons, is my home. Pretty as it is, this is a landscape that has been severely altered and damaged in the last few centuries. Like so many things in the West, and, I suspect, landscapes everywhere, it is close to impossible to tell what is “natural” and what is a remnant of a once intact ecosystem. The other defining feature of my home ground is the river. 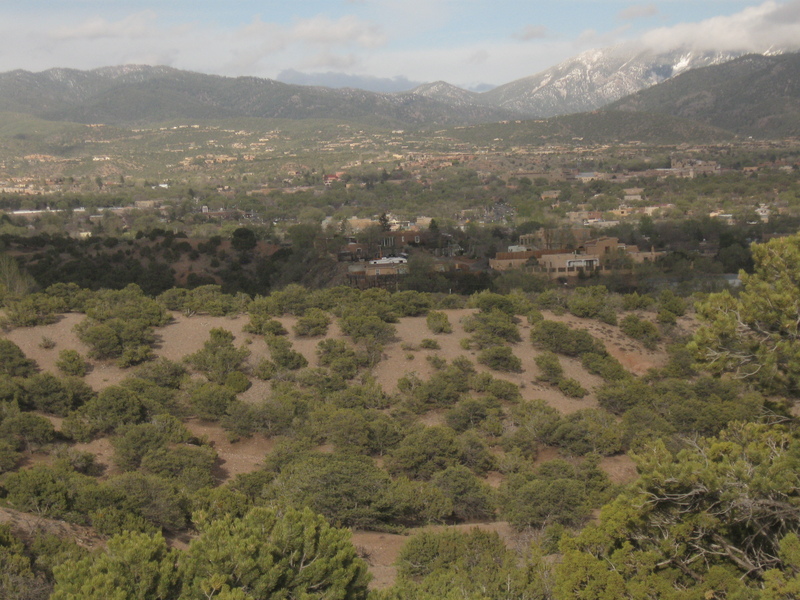 Once free-flowing and healthy, today it’s dry as a bone save for what the city water managers decide to release from the reservoir that supplies this town with its drinking water. The river today is a deep, severely eroded ditch largely denuded of plant and animal life, and heartbreaking to behold. Despite this, we walk it almost daily. It doesn’t always run with water, but contains the flow of our days. I say all this as a preface to my garden post, as a bit of grounding that will help you to see why I consider nurturing this small piece of land an act of healing. For years my garden has suffered because of my stinginess with water. I couldn’t justify watering a few lettuce plants at the cost of the river. My efforts at conservation yielded not much more than bitter greens. The city gives saved water to developers, the cycle of overuse continues. Now I see watering this land as an integral part of restoring the river. Water soaks through my rich soil, trickling back into the water table. The water I use nurtures a kind of ecology, devised by me, yes, in a sort of hit or miss way, but an ecology nonetheless. It sustains insects, bees, birds, and abundant plant life. 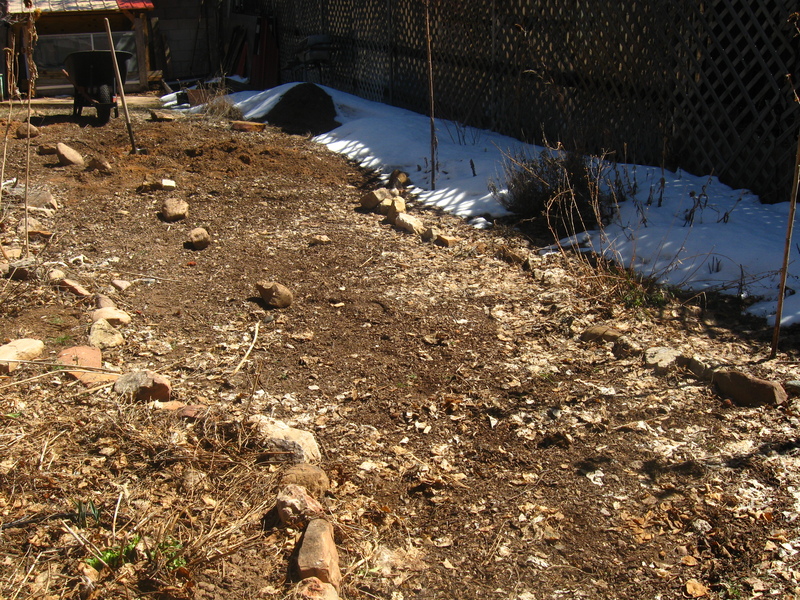 It is a patch of soil that is fed and cared for rather than stripped and neglected. Here’s the huge pathway that used to divide two of my garden beds. (Both of which were in the shade, as it happens.) I spent this spring turning it into fertile beds. Which brings me to another kind of healing–the gift that comes from regular connection with the land. From relating to it in the intimate way that is the gardener’s–touching, digging, sowing, watering, harvesting, smelling, sensing. From the give and take of energy exchanged. From the mutual care-taking that happens when one eats food grown from the soil one has fed. This is healing of another kind of cultural wound, the kind that comes from disconnection with natural cycles, removal from food production, and an acceptance of the loss to human and plant communities that is its inevitable result. The next level of healing that takes place in the humble garden is of the broken system we are so entrenched in–the system that keeps us reliant on imported food, petroleum powered corporate agriculture, and an economic system that doesn’t aid our communities. 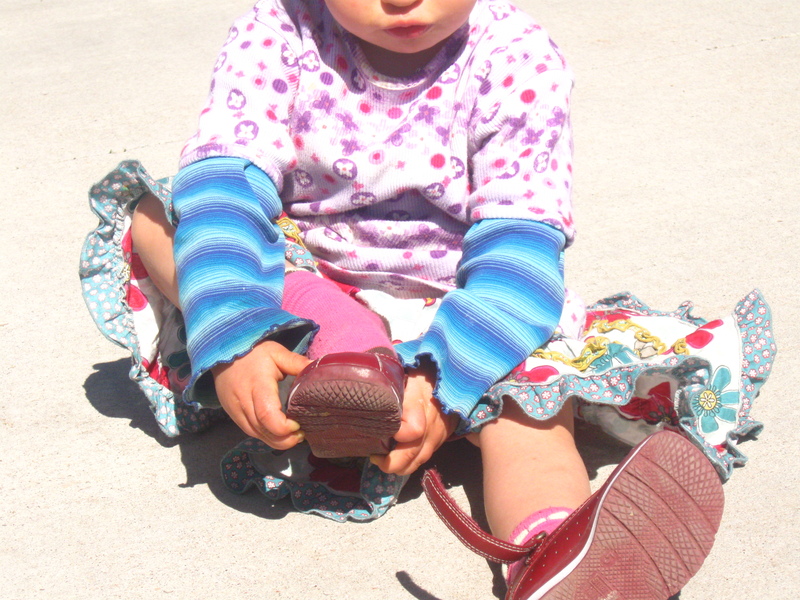 At the same time we are shut off from our neighbors, our land, our water supply, and our own resourcefulness. It’s a question of dependency on the System vs. interdependence with Place. So that’s why I water my garden now. By hand, often, and thoroughly. That’s why I turn kitchen scraps into black gold, and keep on trying. It doesn’t always yield what I hope for. But at the same time it yields so much more. And each year we become a little more whole, my land and I.
I’m loving your garden posts. I’ll post the whole collection May 1st. and that you’re finding your way out into it. Head out onto the land. Greet your old friends with a cry of happy recognition. Make your prayer, offer thanks. Ah, that joyful exchange of praise and pruning for medicine. Wander, greeting the plants all around, eyes tuned to the rocks, the sand, the sky. The dusky green that makes even this dry land abundant. Oh friends, your beauty and goodness are a song I’ll never stop singing. And they will honor you with their healing. 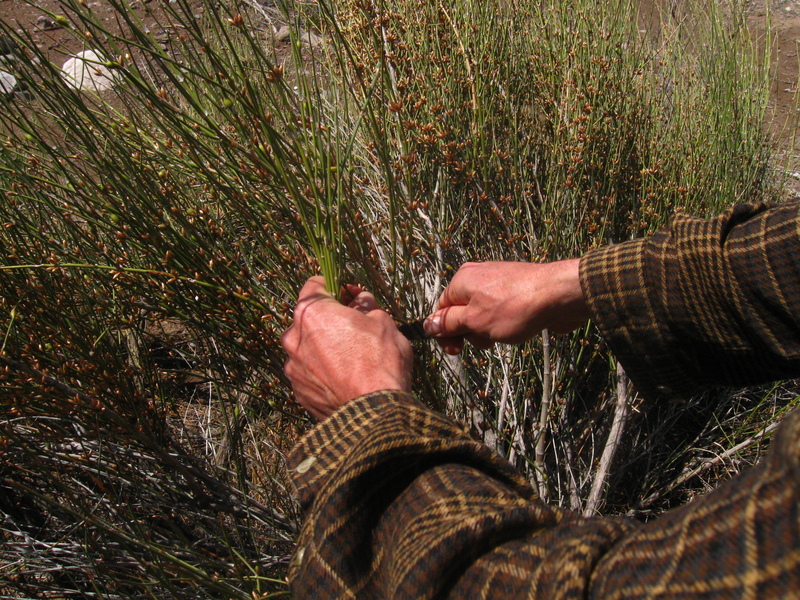 The long, thin “leaves” are Mormon Tea, found flowering and abundant in a wash down south. We’ll add it to our daily tea blend for its rich mineral content and nourishing powers. 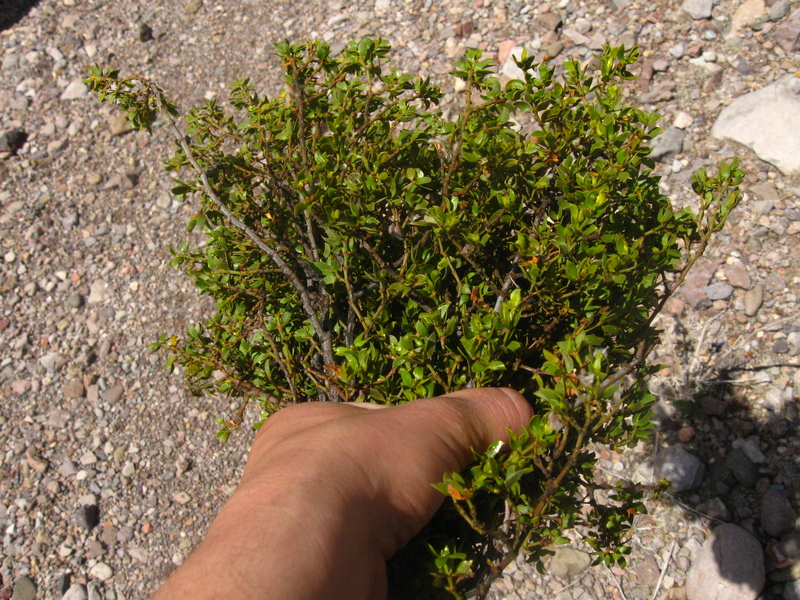 The small, shiny round leaves are from chaparral (creosote bush to non-herbalists). 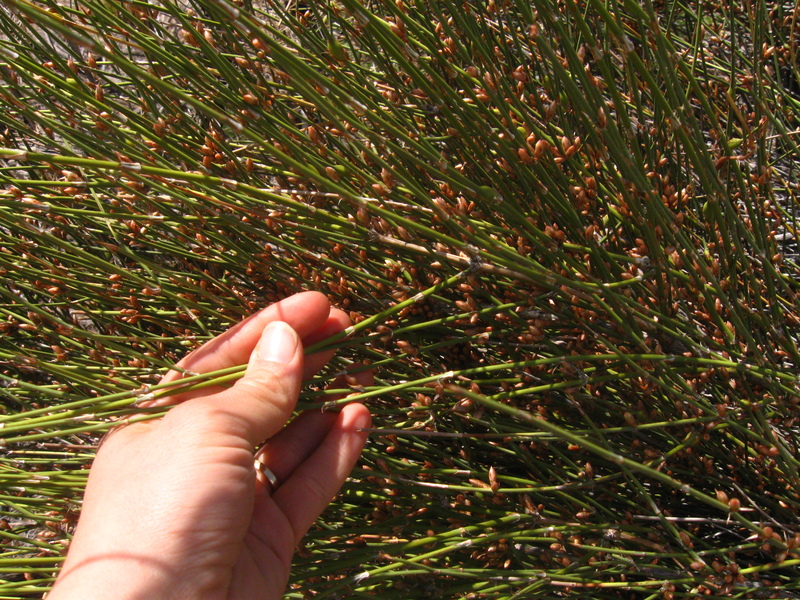 This plant reigns over the Chihuahuan desert, and is potent medicine. I’m making oil to use as a base for sunscreen this summer. 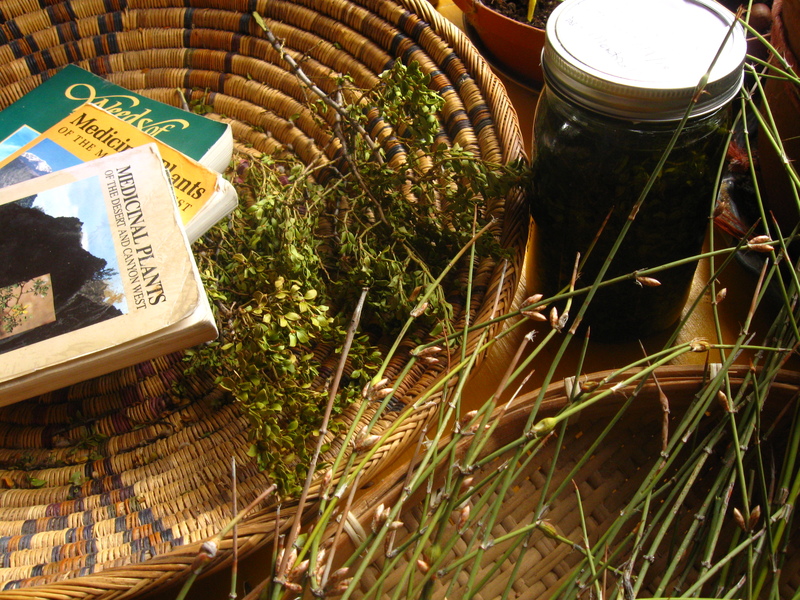 Our favorite books for this area are the ones written by our beloved teacher Michael Moore: Medicinal Plants of the Desert and Canyon West and Medicinal Plants of the Mountain West.